Are you planning a Florida holiday and looking for June 2020 Orlando flights? Contact us for advance fares on major airlines including BA, Norwegian, United and Virgin. Combine your flight with car hire for a great-value Florida fly-drive. Add accommodation for a package holiday at an excellent rate. How much are you expecting to pay for your June 2020 Orlando flights? Don’t be surprised to find prices exceeding £600. Follow our tips below and you could buy your seats for as little as £385 per adult and £325 per child. We book with quality airlines such as BA, United, Virgin and Norwegian and we achieve great-value fares. Our technique is simple. When fares are released (11 months before departure) we don’t book them straight away. Instead, we wait until prices drop. This simple method allows us to provide excellent-value advance fares. Book now to reduce your costs. And reduce your stress levels too. No need to keep looking at airport websites. We take the strain. June is a shoulder season and prices are good value throughout the month. Fly direct from Gatwick, Manchester or Glasgow for a decent price. Depart on a Tuesday or Wednesday – mid-week flights are cheaper than weekend departures. Book in advance. Early bookers are first in the queue when flights are released – it’s first come first served on cheap June 2020 Orlando flights. Indirect flights from Heathrow are a great way to save money on peak dates. It’s probably not worth considering them in June – direct Florida flights from Gatwick are good value throughout the month. Orlando International is the most popular airport in Florida, but there are several alternatives. A Miami, Tampa or Fort Myers arrival might be more convenient and better value. Do you want the convenience of flying from your local airport? Depart Exeter, Newquay, Isle of Man, Jersey, Edinburgh, Aberdeen, Inverness or Belfast for a small supplement. Timings are excellent and flights connect with the Virgin or BA network. Your luggage is checked straight through to Orlando. We’re already taking bookings for June 2020 Florida flights and holidays. Take advantage of our advance fares and book today with a deposit of £100 per person. Add accommodation and car hire for the complete June 2020 Florida holiday package. For more information, complete our online enquiry form or call Alex on 01934 319 851. All our June 2020 Orlando flights are ATOL and ABTA protected. Looking for a bargain? 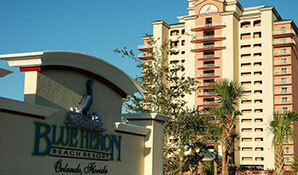 How about our June 2020 Florida holiday at the Blue Heron Beach Resort? Enjoy a two week stay from just £745 person. Flights and car hire are included. The Blue Heron is a family-friendly resort situated on the shore of Lake Bryan. Orlando's top attractions are close by. Facilities include two swimming pools, kiddie pool, outdoor Jacuzzi and two fitness rooms. It's ideal for small families looking for a great-value holiday.